Last week was the Mobile World Congress, an annual conference that brings all of the big Mobile Network Operators, device makers, and technology companies together to reveal new products and discuss the future of mobile. At MWC 2015 there were plenty of high-tech offerings on display, including virtual reality systems, wearables, and new smartphones from makers including Samsung and Microsoft. But one topic that stands out from the crowd is the simpler, cheaper phones being marketed to emerging markets, and how to increase mobile connectivity in places like Africa and South America. Mark Zuckerberg was the keynote speaker, and discussed how his organization Internet.org is working to increase internet access by providing free access to basic internet services in countries including Ghana, Kenya, and Tanzania. With all the buzz surrounding mobile connectivity in Africa, GeoPoll decided to run a survey in collaboration with World Wide Worx to see how those in 5 African nations are really using their devices. We surveyed 700 people each in Ghana, Kenya, Nigeria, South Africa, and Uganda to find out what devices are most popular, and what services people are using on their mobile phones. 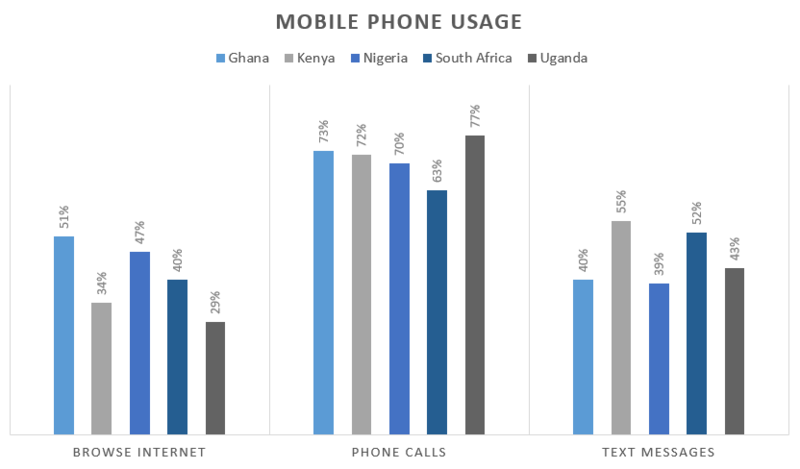 The results provide an interesting glimpse into how mobile phones are used in Africa, and how it differs from usage in the US and other Western countries. Results show, unsurprisingly, that calls are the most popular activity on mobile phones in all 5 countries, followed by SMS/text messaging. 71% across all countries say they make calls on their phones, and 46% say they use SMS/text messages. The drop off between calls and SMS could be explained by the high cost; most people in Africa are on pay-as-you-go plans, and text messages are expensive. 40% of the 3,500 total respondents report browsing the internet, and 26% say they download and run apps on their phones. However, these two measures vary by country. Ghana has relatively high internet usage, with 51% saying they access the internet on their phone, and 31% reporting they download apps. In Kenya, only 34% use the internet on their phone, and in Uganda that number drops to 29%. Accessing Facebook is another popular use of mobiles, with 48% in all 5 countries saying they view the social media service on their phones. 42% say they listen to the radio on their phones, and 37% take photos. Only 13% use Twitter, demonstrating the dominance of Facebook in Africa. We also asked mobile phone users what phone brand they use the most, with Nokia and Samsung coming out on top, at 34% and 17% respectively. More high-end brands such as Apple and Blackberry have small adoption in Africa, with only 2% reporting they use an Apple phone, and 6% using Blackberry models. However, 17% of phone users say they think a Blackberry will be their next phone brand, and 11% anticipate buying an Apple phone in the future, demonstrating that smartphones are becoming increasingly popular across all 5 countries. This data provides a quick look into how mobile phones are being used across Africa. As the number of people with access to the internet and data plans increases, it will be interesting to see how mobile habits change. GeoPoll collects data on everything from media measurement to food security; if you’re interested in running your own mobile survey with GeoPoll click below to contact us!